Jeffrey S. Ashby, Pamela A. Melroy, David A. Wolf, Piers J. Sellers, Sandra H. Magnus, Fyodor N. Yurchikhin. Steven Lindsey, Mark Kelly, Lisa Nowak, Michael Fossum, Stephanie Wilson, Piers Sellers, Thomas Reiter (up only)(ESA). Brent W. Jett Jr., Christopher J. Ferguson, Heidemarie M. Stefanyshyn-Piper, Joseph R. Tanner, Daniel C. Burbank and Steven G. MacLean, CSA. Roman Romanenko, Robert Thirsk, Frank De Winne. Chris Ferguson, Doug Hurley, Sandy Magnus, Rex Walheim. *Reentry and burnup date for Progress, ATV and HTV cargo vehicles. **Long-duration (resident) crew members are listed in bold type. 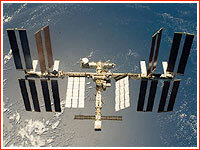 ***The propulsion section of the Progress spacecraft, which delivered Docking Compartment 1 to the station was undocked and deorbited on Sept. 26, 2001. 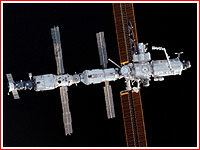 ****The propulsion section of the Progress spacecraft, which delivered the MIM-2 module to the station was undocked and deorbited on Dec. 8, 2009. *****The The Bigelow Expandable Activity Module, BEAM, module was fully inflated on May 28, 2016, after being attached to the aft port of the Tranquility Node using the station’s robotic arm Canadarm2. 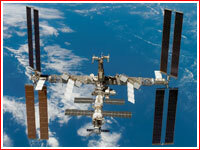 The module was scheduled to be undocked and discarded in 2018. 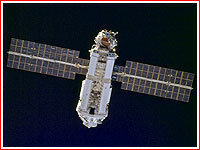 The station's orbital construction started in November 1998 with the launch of the Zarya FGB control module. This photo was taken by the first approaching Shuttle crew during the STS-88 mission. 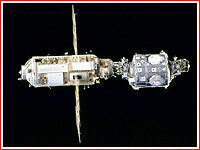 The Zarya FGB control module (left) docked to the Unity module in the aftermath of the STS-88 mission in December 1998. 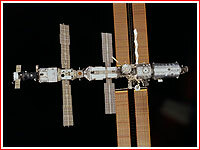 The ISS, including recently arrived Zvezda service module and the Progress cargo ship, as seen at the end of the STS-106 mission on Sept. 18, 2000. 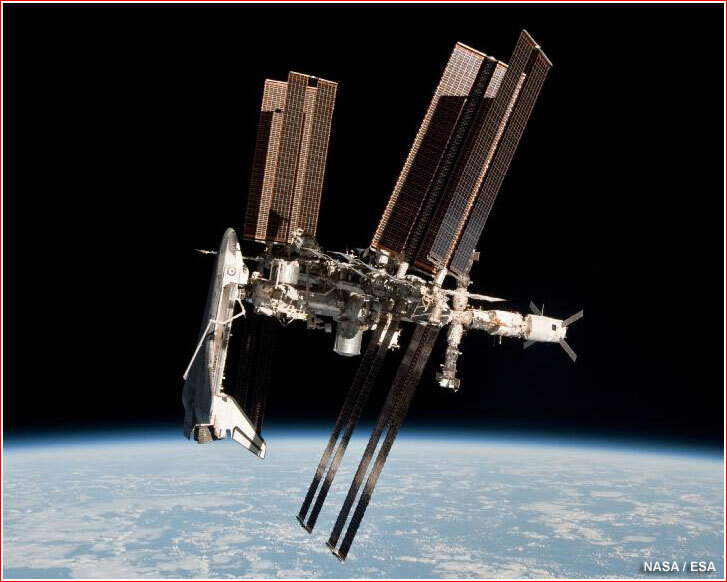 A visible size of the ISS grew dramatically with the delivery of the P6 truss, which unfurled giant solar panels above the outpost. 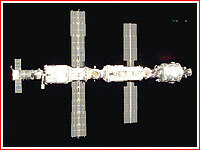 The ISS after the STS-98 assembly flight in 2001, which delivered the Destiny lab (far right). The Quest airlock (top right) and the robotic arm had been the latest additions seen by the departing crew of the STS-104 mission. 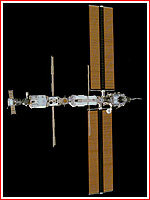 The station, as seen by the departing crew of the STS-110 mission. Newly delivered S0 truss can bee seen traversing the US segment. 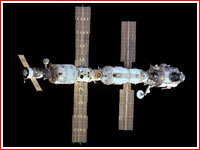 Also, a recently added Pirs docking compartment extends down from the Zvezda service module's nadir port. 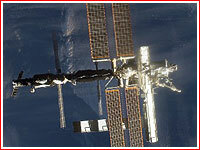 The ISS as seen from the departing Space Shuttle Discovery at the conlusion of the STS-116 mission on Dec. 19, 2006. 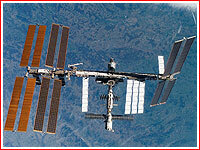 A new P5 spacer truss segment was added and P6 solar array wing was retracted during the mission. 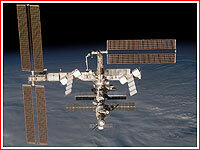 The ISS as seen from the departing Space Shuttle Atlantis at the conclusion of the STS-117 mission on June 19, 2007. 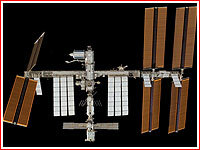 The ISS as seen from the departing Space Shuttle Discovery at the conclusion of the STS-120 mission in November 2007. 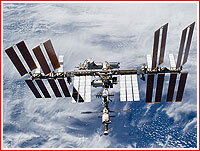 The ISS as seen from the departing Space Shuttle Atlantis at the conclusion of the STS-122 mission in February 2008. 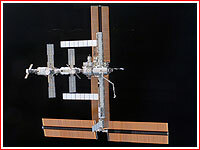 An almost completed International Space Station was photographed by the departing crew of the Space Shuttle Discovery at the end of the STS-119 mission on March 25, 2009. 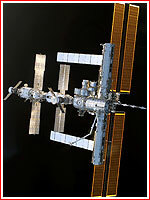 A view of the ISS at the conclusion of the STS-131 mission in April 2010, with non-Russian segments of the outpost virtually complete. Click to enlarge. 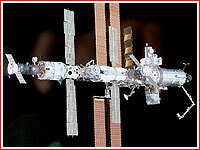 A view of the ISS at the conclusion of the STS-133 mission on March 7, 2011, captures European ATV-2 (bottom) and Japanese HTV2 (center) cargo ships docked at the outpost.